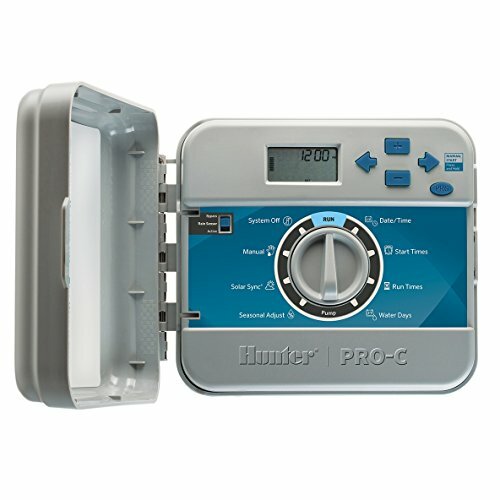 With it s proven reliability and flexibility to expand on demand, due to it s modular design, the Pro-C has been the contractor s choice in residential irrigation control since 2001. When you don t need expansion, the fixed 6 and 12 station models offer affordability in a high-end residential controller. The Pro-C easily accommodates Hunter s Solar Sync with no additional wiring. You can easily upgrade and program to smart control using the Pro-C s new Solar Sync dial position. The Hunter Solar Sync is an EPA WaterSense labeled smart device that adjusts Hunter controllers daily, based on your local weather conditions, by calculating evapotranspiration (ET). This results in water conservation and savings. All AC powered Hunter controllers, including the Pro-C, are now EPA WaterSense labeled when you pair them with the Solar Sync weather sensor. If you have any questions about this product by Hunter Industries, contact us by completing and submitting the form below. If you are looking for a specif part number, please include it with your message.